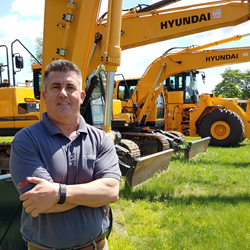 Modern Equipment & Supply has announced the establishment of a rental fleet of Hyundai Wheel Loaders and Excavators to serve its customers throughout Eastern Pennsylvania and New Jersey. As a full line Hyundai dealer Modern will be able to provide tracked excavators ranging from 3,000 to 100,000 pound capacities and wheel loaders up to 65,000 pound capacities. All units come with the impressive range of standard features Hyundai is known for including weight sensors, backup cameras, terrain safety systems, digital vehicle diagnostics and tracking, plus full cab AC/Heat and bluetooth entertainment system. Modern is building the fleet to handle projects large and small with flexible rent periods and rent-to-own options. "Without doubt the launching of a rental fleet is an exciting moment in our relationship with Hyundai," said Rick Nelson, Vice President and General Manager of Modern Equipment & Supply. "Every contractor, municipal worker, or business owner who has hopped behind the controls of a Hyundai knows that this is a different breed. Hyundai builds these machines to not only excel on the jobsite, but deliver the best ROI on operating costs anywhere. This rental fleet give us the opportunity to put more people in that seat and show them what a Hyundai can do on the job." "Furthermore the continued success that we have had with the Hyundai heavy construction line, not to mention this new rental fleet, has sharpened our focus to recruit additional technicians throughout our service territory," Mr. Nelson added. "There has never been a more exciting or rewarding time to join Modern, we look forward to welcoming new employee-owners on board." The quickest way to rent is contacting Modern toll free at 855-5-RENT-MO (855-573-6866) or visiting Modern's construction rental homepage. Modern Sales Representative Ron Dortone Sr. (DortoneR[at]moderngroup.com | 267-718-7287) has been tasked to manage and grow this new business. Assisting him will be Modern's Hyundai Construction product manager Sam Maury (MauryS[at]moderngroup.com | 717-682-4236) and territory rep Chris DeRonde (Chris.DeRonde[at]moderngroup.com | 732-674-1067) handling Northern New Jersey.